David Howe delves into the vaults and brings back the low-down on this cult title from the 1970s. These days we tend to take cinema and genre magazines very much for granted. Most are produced to a high standard and contain genre related news, features and interviews. Back in the 1970's, however, the outlook was not so rosy. Film magazines were hard to find and most originated in the states. Some were long runners (Famous Monsters of Filmland) and others had a far shorter term (World of Horror which ran for 8 issues). Then, in 1976, a magazine appeared on the newsstands which would, in many respects, set the standard for the next decade. It was called The House of Hammer and was the brainchild of its editor, Dez Skinn. Skinn's first attempt at a genre magazine pre-dates this by several years. He was working at IPC and, through his interest in horror, came up with an idea for a magazine called Chiller. This was to contain features on Doctor Who, Hammer films - all the things that he was interested in. Eventually, however, the publishers decided to call it The Buster Book of Spooky Stories. Dez did two issues of this and then moved on to work at Top Sellers. It was while he was there that he took over the editorship of The House of Hammer's forerunner, Monster Mag. Monster Mag was originally published by Warner Brothers as the British contribution to an international publishing company that would produce foreign language editions of all the magazines. Monster Mag ran for 14 issues before it was taken over by Dez and it subsequently ran for 3 further issues (Volume 2) before it stopped. The problem with Monster Mag from Dez's point of view was that he couldn't fit much in it - as it was a poster magazine, one side of the fold-out sheet was taken up, leaving only 7 pages for actual feature material. As Hammer Films were only four doors away in the same street as his offices, it was perhaps fated that Dez would hit upon the idea of a magazine all about Hammer and their work. The wheels were oiled by the fact that the Managing Editor of Warner used to play golf with Michael Carreras, the Managing Director of Hammer Films, and so The House of Hammer was born. The first issue appeared in October 1976 (it was trailed in Monster Mag as a small teaser ad in Volume 2 issue 1 and then as a full page ad on the back of volume 2 number 3). The cover of issue 1 was drawn by Joe Petagno and the contents set the trend for almost the entire run of the magazine. 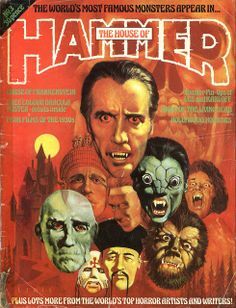 The main feature was a comic adaptation of Hammer's Dracula, with written features on Christopher Lee, the Captain Kronos film, special effects and vampires. As well as John Brosnan and Barry Patterson, who had worked on Monster Mag, the writing team was completed by Tise Vahimagi, John Fleming, Benny Aldrich and Steve Moore. It wasn't until issue 2 that the magazine's visual identity was established with the popular formula of a full colour Brian Lewis cover, together with a more stylised logo. Future issues saw artist, John Bolton joining the team and adapting many films into comics, as well as numerous feature articles and information on, not only the work of Hammer Films (which was rapidly decreasing as the years passed by) but on other genre films and trends that were emerging during the 70s. The lions share of the cover art went to the late Brian Lewis, who consistently came up with imaginative and striking images. Perhaps one of the most effective was that for issue number 4, which was also the issue that saved The House of Hammer from cancellation. 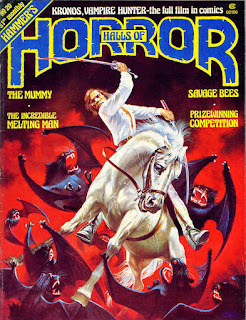 Sales had not been good on the first three issues, but with issue 4 a competition was run to win a trip to Transylvania, and, together with a striking image of a vampire from Legend of the Seven Golden Vampires, and a coated cover (giving it a shiny gloss that the previous issues had not had) the issue established the magazine in the marketplace and almost guaranteed it a long run. The format that Dez instigated: reviews, photographs, features and news on all aspects of the genre (covering films, television, magazines, books and fan-related happenings) is still with us today. Indeed, following The House of Hammer, Dez started up Starburst magazine in 1977, using the same basic format and the same writers. Starburst is still going strong today - albeit with a different editor and different writers (although John Brosnan's 'It's Only A Movie' column is still there!) - testament perhaps to the validity of the original concept. 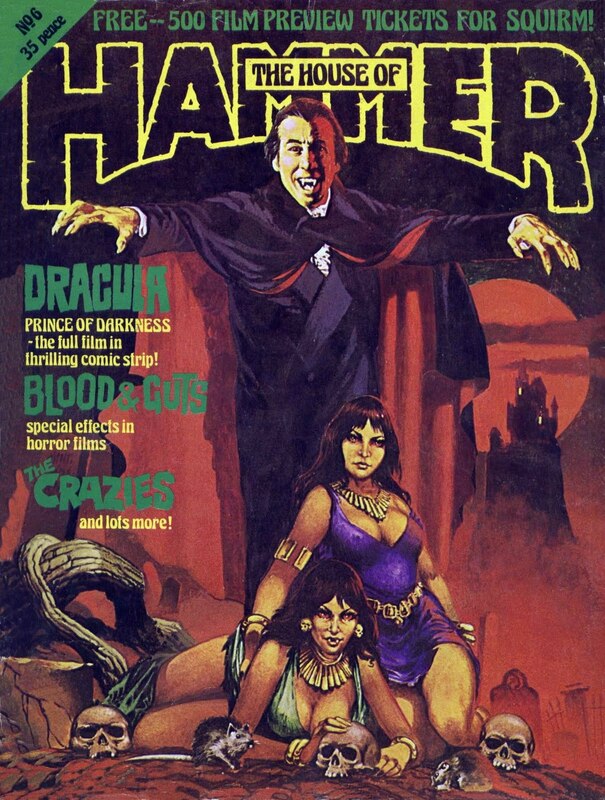 The House of Hammer successfully ran through 18 issues but for issues 19 and 20 its title changed to House of Horror. The reason for this was purely commercial. The magazine was set to break into the American market and the American distributor suggested that the current title would confuse people into thinking it was a woodworking magazine - distributors say some odd things!. Therefore House of Horror was agreed upon as being a suitable alternative. 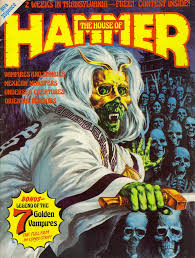 However, Jim Warren, the American publisher of Famous Monsters of Filmland, amongst others, put together another low print run magazine, also called House of Horror, which hit the US newsstands just before the British one was due to be distributed. By American law, it is the magazine that arrives on the newsstands first that owns copyright on the title. Therefore, Warren immediately prevented distribution of the British House of Horror as he already owned that title. To get around this difficulty, Dez found an American printer that could print an opaque block over the words 'House of' on the covers of all the magazines and replace it with something else, thus avoiding the titular clash. He then contacted Jim Warren to explain the situation and gave him the option of licensing the magazine himself and getting the money that would have otherwise have been paid to the printers to change the title. Warren took the money and licensed the title. Therefore for two issues, the magazine was House of Horror (this being the number that had been printed at the time) and from issue 21 it became Halls of Horror (which is what the words 'House of' would have been overprinted with if Warren had not licensed the magazine) thus ensuring its own individual identity once more in the American market. Disaster struck three issues later, when the British publishers decided that there was more money to be made in other areas, and disbanded the whole department. Halls of Horror temporarily ceased to be after issue 23 in August 1978. Dez Skinn still had sufficient belief in the magazine to buy the rights to it, together with stocks of all the back issues, but was unable to actually continue its publication at the time because, basically, he had run out of money! Starburst was then bought by Marvel Comics, and Dez went with it to work on a number of other titles, including Doctor Who Magazine (then a weekly, and again based on the House of Hammer formula of comic strips backed up with articles) and so Halls of Horror was put on ice. Flash forward to 1983. Dez had been independently publishing a magazine called Warrior that was doing well and he decided to re-launch Halls of Horror on the success of Warrior. Just before this, to test the waters, issue number 24 was published, containing just comic-strip reprints from the earlier issues. That did very well and paved the way for number 25 (Volume 3 Number 1). For the re-launch, the design was handled by the Warrior people, and the writers were a combination of Dez's contacts, and the editor, Dave Reeder's contacts. Writers included Ramsey Campbell, Tony Crawley, John Fleming, Steve Jones, Michael Parry and David Pirie and the mix of features and articles remained pretty much as before. 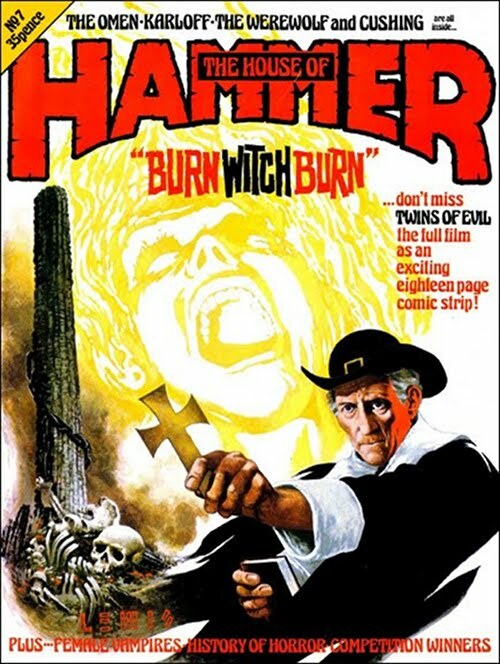 Another major change was the dropping of the coverage of Hammer Films. This was basically because Hammer Films had ceased to produce anything and so the link would have been tenuous to say the least. The comic adaptations were still included, although in the re-launched issues only two films were covered (The Monster Club and Brides of Dracula) and the magazine's final issue (number 30) contained a Videofantasy listing instead. This was because the magazine was intended to go more mainstream with the burgeoning interest in videos, however one of the distributors turned it down because of concerns over the Video Nasty debate that was raging at the time. Added to this, the sales of Halls of Horror were not what the publishers would have liked and so it was stopped once more. This time apparently for good. House of Hammer was one of the best magazines of its time, and is fondly remembered by all who bought it. It had a style and a look all of its own, and the combination of Brian Lewis' covers and John Bolton's comic adaptations made it an essential collectors item for all fans of fantasy artwork. With thanks to Dez Skinn.